Our guest today is an old, young, friend. David Fell from Abiding Acres, where he raises sheep, chickens, and my favorite: beef. This isn’t any average beef cattle, but pure bred Red Devons, a heritage breed ideal for the grass based system at Abiding Acres. Today, we’ll be discussing what got David farming, why they raise sheep, what’s special about the Red Devon and why it’s better than an average Angus steer. Whether you’re a meat eater or not you won’t want to miss this interview with David Fell. David starting farming when he was 10 years old, with his family’s encouragement and involvement. 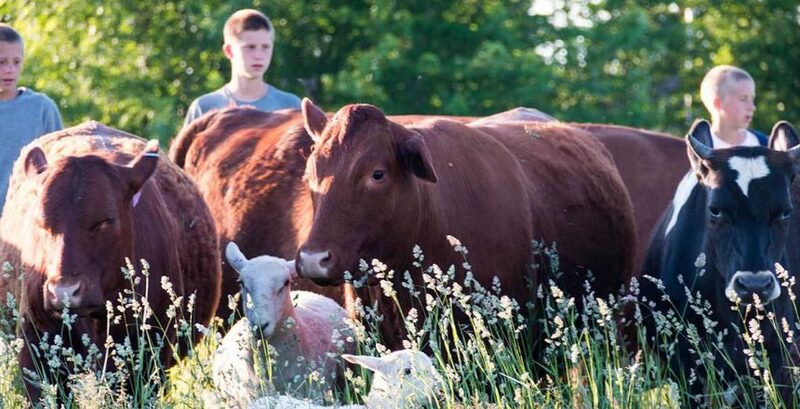 Abiding Acres raises grass fed Red Devons, pasture poultry, and pastured lambs. David’s two favorite Joel Salatin books are, You Can Farm and Everything I Want To Do Is Illegal. The Red Devon was the first pure bred breed of cattle. George Washington raised Red Devons. The Red Devon is a little shorter than an average Angus, very efficient on grass. Abiding Acres choses to raise Red Devons for several reasons, but first and foremost because they are a docile breed. Lambs are the height of the cuteness pyramid. What isn’t in the meat is just as important as what is. Abiding Acres livestock is fed the food they are designed for.